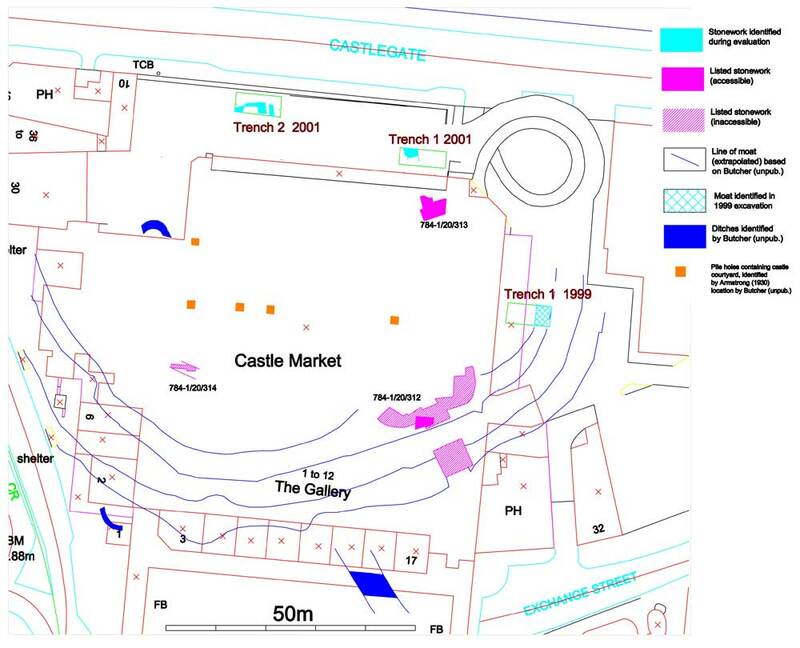 Here is a schematic from ARCUS showing the location of known Castle remains. It identifies the ARCUS trenches and also features identified from Armstrong & Butcher’s work. Is there an aerial photo view of the current site? Most interested to see what remains of the castle as a whole following forthcoming excavations. As someone local who has also studied castle architecture for nearly three decades this particular project has been a long time in coming. Though not entirely relevant to this sub section of the website, i can’t help but feel that whatever existed probably differed somewhat from the famous artists impression we all know so well. As a mid to late thirteenth century building built from new, likely without having to incorporate previous stone structures, the castle would probably have been similar in many ways to contemporary fortified edifices erected in Britain at the time. That said, the peculiarities of the site would have to be taken into account, and the nature of the current discovered remains suggest a single line of defence round the inner ward rather than something like the concentric constructions of Edward I in Wales. Though earlier and not built with domestic convenience in mind, the inner ward of the castle of Beeston in Cheshire illustrates this theory pretty well, as there are some similarities in siting. The similarity arising from taking advantage of strong natural cliff defences away from the field, and the concentration of man made defences towards the only easy approach. As with Beeston, it is likely the defences might have been slighter on the naturally defended parts of the perimeter, and as they were less vulnerable to attack, perhaps incorporated more angular constructions. Reasons for this being both to conform to the site, and for the ease of fitting domestic structures inside them, which would be far easier than in the rounded forms typical of 13th century fortification. The “Great tower” mentioned in documents, is, unless an earlier survival, unlikely to be of rectangular form if constructed in the 13th century, indeed such towers were starting to fall out of fashion around the cited date of the rebuilding. However, most of the great Yorkshire castles had a great tower of some form, so there may be an element of “keeping up with the Jones’s” motivating the builders. If evidence remains of the tower, it will be interesting to see if it formed part of the main line of defence or a secondary defensive structure and point of refuge. I would imagine on a constricted site, that unless the great tower combined domestic and defensive functions it would be a strange choice to site it within the enclosure. Doing so would mean using valuable space that could usefully serve in accommodating other buildings. Hoping that a relatively complete ground plan can be recovered, but rather doubt it due to unsympathetic later development. This was based entirely upon certain accounts of the castles history which suggest the c1270 building to be the first stone castle on the site. While not unheard of, it would be rather unusual for a early wooden castle to survive to such a late date without some reconstruction in stone, especially on a site of significance. The assumption that the castle was still a wooden structure up until the c1270 rebuilding seems largely to stem from the account of its destruction by burning. As i am sure most would be aware, significant damage can still be rendered to a masonry building by fire, and the destruction of roofs, floors, and other combustible fittings and fixtures would certainly make dwelling there as a residence or fortification much less desirable. The point of all this waffling is that there is a possibility that pre 1270 stone buildings may have existed, and evidence of such may be discovered in the excavation. Another possibility that seems likely concerns the section of lesser ditch shown on the plan just above the scale of measurement. The axis of its projected line and general situation strongly suggest the existence of an outwork or barbican structure protecting the gate, and enabling flanking fire across/along the line of the main defence. Given its distance from the abutment of the drawbridge to the main ward, if the ditch is evidence that such a structure existed, it looks to have covered a sizeable area, and perhaps contained ancillary structures. There are remains of roughly contemporary examples of such features at sites such as Goodrich, The Tower of London, and locally, Sandal and Pontefract. Yet more theory on the other part of the remains labelled on the plan 784-1/20/313, and Trench 1 2001. These two structures look to be linked by a common axis and also appear to be similar in dimensions relative to the thickness of the walling. It would be tempting to speculate that they form part of the same building, and looking at the photographs, there is ornate window tracery, a probable pillar base, and what possibly could be an external buttress. All these features, and the suggested axis of siting drawn from the remaining buttressed corner of the structure, suggest to me that this is likely to be the remains of the castle chapel. If so, the other main domestic apartments are likely to have been situated nearby, and a general layout similar to Skipton castle seems to be a feasible possibility. (i.e) The main domestic buildings (Great Hall, Chapel, Apartments etc.) grouped towards the strongest natural defences, allowing for the safer employment of larger window openings, and a ring of more defensively minded structures on the side facing the field of approach. Last one! Feel a bit silly having made all this guesswork without realising how much information was already known about Sheffields castle. It contains a great deal of fantastic information, combing both visual and documentary sources from all the investigations so far. While feeling a little foolish about writing all of the above posts in ignorance of the wealth of existing information, an enthusiastic fool is perhaps better than an apathetic one! I’m a final year Architecture and Landscape student studying at Sheffield University. I am hoping to create a design a proposal for the area that is underpinned by the history of the Castlegate site. I wondered if perhaps you may be able to point me in the direction of how I may be able to obtain an archeological map of the castle remains. I have looked at the map shown on your website which identifies the trenches and ditches but I wondered if you perhaps knew of where I might be able to find one which shows the remains in greater detail. I would be very grateful for any information you may be able to provide. Thank you.